[Updated] Bermuda continues to rack up the Island Games medals — including three more golds — as Dominique Mayho, Chris Estwanik, Taahira Butterfield, Natasha Trott, Adrienne Smatt and the women’s cycling team have all added to our medal tally. Taahira Butterfield won gold in the 200m in a time of 25.51, Natasha Trott won silver in a time of 25.62, and Faye Cox from the Shetland Islands rounded out the top three, with the placings actually being completely the same as the 100m which was held earlier this week. Cyclist Dominique Mayho won gold on the Men’s Individual Town Centre Criterium, while Chris Estwanik won his third Island Games medal earlier today [July 3] racing to victory in the 10,000m. Bermuda’s cycling team of Gabriella Arnold, Karen Bordage and Zoenique Williams combined to win a bronze medal in the Women’s Team Town Centre Criterium, while Adrienne Smatt picked up the silver in the 50m Prone Smallbore Rifle competition. 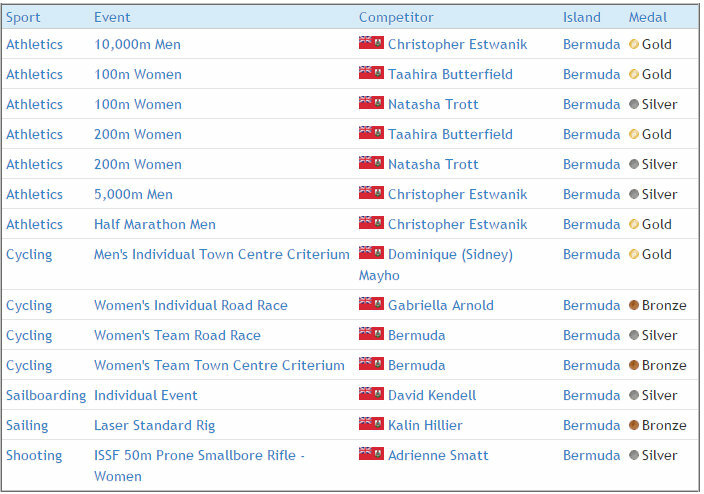 This brings Bermuda’s medal tally up to 14, as Gabriella Arnold won bronze in the cycling road race, she and Karen Bordage combined to win silver in the team competition, Chris Estwanik won gold in the half marathon and silver in the 5000m, Taahira Butterfield and Natasha Trott won medals in the 100m, David Kendell won silver in sailboarding and Kalin Hillier claimed a bronze in sailing. The 2015 Island Games — which concludes today — has nearly 3,000 athletes from 24 islands competing, and Bermuda is being represented in badminton, basketball, track & field, golf, shooting, volleyball, windsurfing, sailing, tennis, archery, triathlon and cycling. 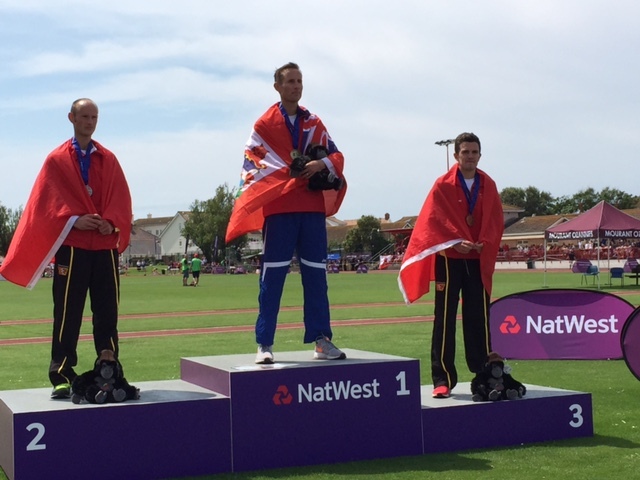 Click here to view all our coverage of the Island Games. Update 1.35pm: Bermuda has won two more medals with the men’s golf team of Jarryd Dillas, Will Haddrell, Damian Palany and Mark Phillips winning bronze, while the Bermuda men’s basketball team has won silver. fabulous medals haul! Congrats to all! Awesome! When does the team return…it would be great to welcome them! I’m thinking we should have a small parade in their honour. They did extremely well.